Cross-match sewed by authentic leather and lightweight fabric to refresh your expectation and needs. 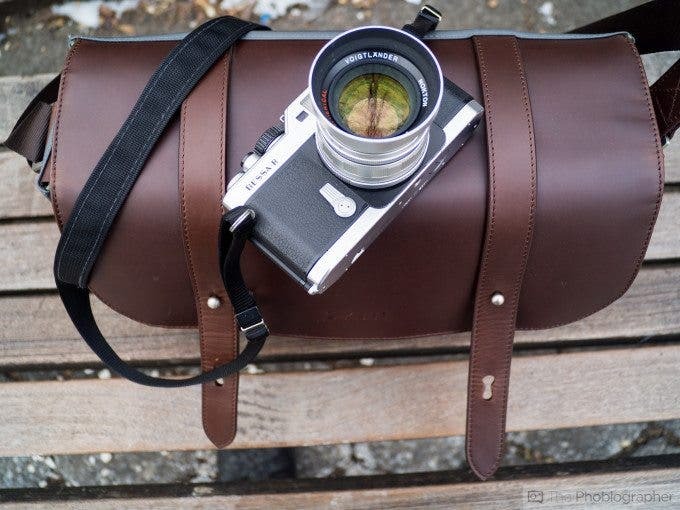 The trend of beautiful, leather products has been around for a while now in the photo industry since ONA started strutting their sexiness all over the place. But on a recent trip to the Lomography store in NYC, I stumbled upon something else extremely beautiful but a little different. And upon asking them about the bag, I was introduced to Zkin. The company seems to be quite new (or at least their approach to the industry does) but already has an impressive lineup of bags. And the one that really caught my eye is the Champ. Don’t ask me why they call it this. But for what it’s worth, I’ve found a bag that’s not only stylish, but also pretty damned functional. This squirrel decided that it would be cool to photo bomb our shoot. 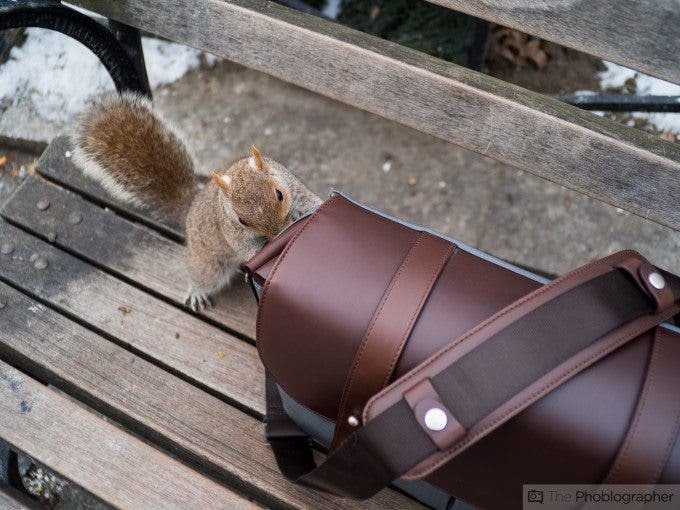 First and foremost, the Zkin Champ is a bag designed for mirrorless cameras. However, you can cram a lot more into it if you choose. The bag’s retro cool and modern ergonomic fusion makes it appealing to many. It’s a gorgeous bag if it suits your fashion statements. Zkin’s Champ comes in a couple of different colors, but the one that was available for me is the green and brown. As a fashion conscious New Yorker and a business man, I didn’t exactly think that this could go with everything. But so far it’s been working quite well. The front is characterized by two buckles that close the bag. Behind these are pockets. While the leather on top doesn’t feel like the quality that ONA and Holdfast Gear make (blame my All American Made snobbery on that one) the overall build isn’t shabby at all. In fact, the bag is extremely solid and feels as if it can not only take all the abuse that I can throw at in by living in NYC, but also just overall craziness that is a busy Editor in Chief’s life. The bag so far has been able to stand up to a lot of the abuses that commuting on the NYC subway system entails with folks bumping into the bag like fish in a bucket. The contents were always well protected. With that said though, I modified the interior a bit so that the padding allows me to carry more stuff. In fact, I was able to stick a Voigtlander Bessa R, Fujifilm X Pro 1, Olympus OMD and a Voigtlander 17.5mm f0.95 in here with no real trouble. Of course, not everyone totes around three cameras–which means that you won’t have any issues with this camera bag and bringing gear around. My only problem though is the lack of quick access to my gear. I need to undo the buckles each time and step to the side. If I were still a paparazzi, this would totally be a no go. But it works fine for my street and portraiture work. If you’re spending $249, you’d better get a bag that’s super awesome. And Zkin surely delivers on that factor. The question that you need to ask yourself is whether you need quick access or not. As a street photographer, I don’t often change lenses out and I typically hold my camera in my hand, so it’s not an issue for me. If I’m shooting on-location portraits, I’m typically using one lens and light and if I’m switching lenses then I’m also probably changing the look of what I’m shooting. And in a case like that, I really do like a more fashionable approach. The bag is sexier than most of what Think Tank and Lowepro put out, but we don’t think that it can quite match what Holdfast Gear and ONA do. Still though, it’s a bag that surely deserves praise.